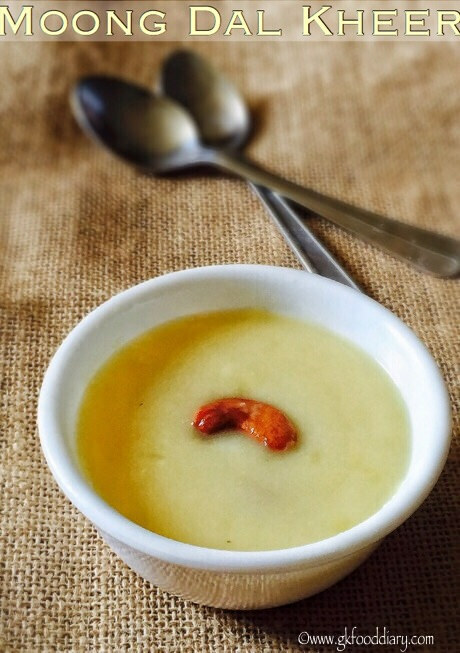 Moong Dal Kheer - Easy and healthy kheer made with moong dal, nuts and coconut milk. Keep all the ingredients ready. Roast moong dal with ghee until nice aroma comes and pressure cook it for 4 whistles with 1.25 cups of water in medium flame. In the meantime,ghee fry the cashews&raisins and keep it ready. Heat jaggery in a saucepan with water until it's immersed level. Once it melts completely, strain the jaggery water through a strainer to remove impurities and keep it ready. Open the pressure cooker once pressure released. Mash it with a laddle if required, but make sure Moong dal should be soft but not too mushy, so don't mash too much. Now add filtered jaggery water to cooked moong dal and mix well. Also add crushed cardamom. Now cook everything in a low flame for 3 to 5 minutes. Stir it occasionally while cooking in order to prevent the bottom from burning. Then add coconut milk and mix well. Cook in low flame with occasional stirring until the kheer becomes slightly thick. Once everything comes together and when the kheer consistency is reached, add ghee fried cashews & raisins. Mix well and switch off the flame once done.